You might think what's so special about this doorbell. Well, it might be not that special but think of it this way, you have three doorbell buttons and different sound for each button. One is for your friends and family, one is for postman and one is for normal people. 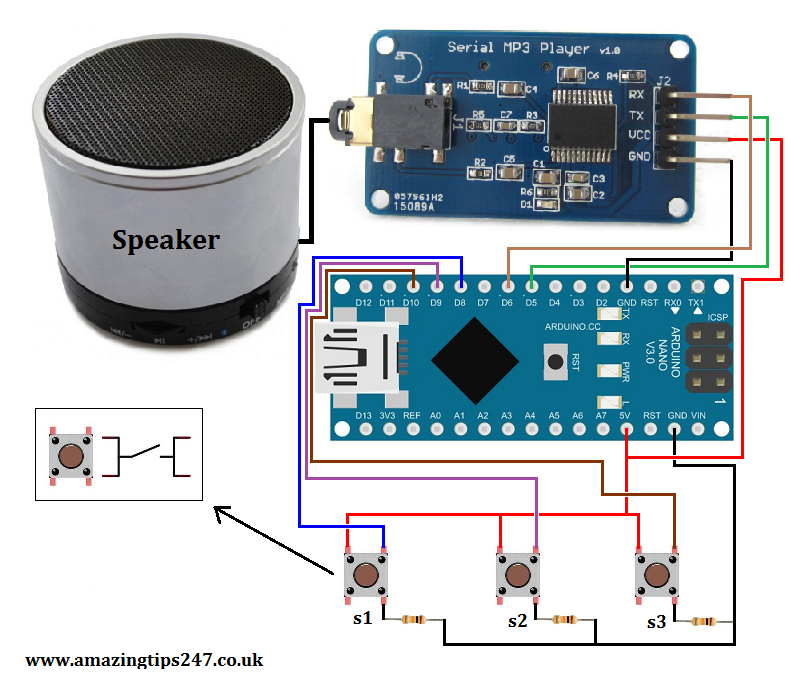 Every time when postman comes he pushes the dedicated button, you will know that that's a postman because of the different sound it (arduino doorbell) will make. So for example, you got something coming by post, you will be happy and rush to the door to open it. You might as wel think what if post man hits the other button? Com on, most of the time people don't play around like that, specially adults. So that means you will get the right kind of doorbell sounds most of the time. Forget the doorbell for a moment, you can even use this sketch as a door or window alert. Something like if someone opens a door or window then it will notify you which door is open or which window is open. So this sketch could be helpful in many ways. What do you need to make it work? * 1× Catalex Serial mp3 player with micro sd card. * 3× Push button switches. * 3× 10k ohm resistors. * And finally the sketch, which you can find right below. Remember you need to have three soundtracks in your sd card and rename it by 001, 002 and 003.
sendCommand(CMD_PLAY_W_VOL, 0X1E01);//This doorbell is for friends and family. sendCommand(CMD_PLAY_W_VOL, 0X1E02);//This doorbell is for post men. sendCommand(CMD_PLAY_W_VOL, 0X1E03);//This doorbell for is normal people. I dont think this circuit works? When you hit the buttons it will short out the power to GND. Can you confirm the buttons are correct. 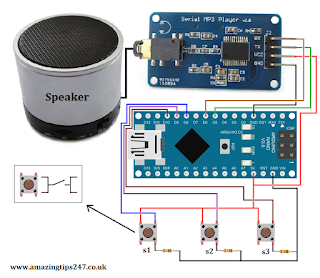 This project is exactly what I am looking to do with my Arduino .I have downloaded this code and wired the UNO as you have shown but unfortunately this code does nor work for me . If I disable your 2nd and 3rd buttons I can get the first audio track to play but I have to hold the button down . I know this is an old post but I was hoping you might be able to check your code with your project again , maybe something was left out of your posted code ? Thanks for your help and great posts . Sorry to hear about your situation , I hope things improve for you quickly . Thank you for the quick reply and the projects you have already shared .